Witticisms like these were the currency of a group known as The Algonquin Round Table, although they referred to themselves as The Vicious Circle. Robert Benchley (A), Franklin P. Adams (B), Alexander Woollcott (C), Dorothy Parker (D) and several other writers started having lunch together at New York’s Algonquin Hotel in 1919. They convened there almost every day for the next ten years. The owner gave them free celery and popovers, but I’m pretty sure that wasn’t what kept them coming back. Woollcott, Adams and Harold Ross had met during World War I while working on Stars and Stripes, a military newspaper. Benchley, Mrs. Parker and playwright Robert Sherwood were colleagues at Vanity Fair. Others were included, and before long the luncheon group on any given day could be 20 or more. The owner of the Algonquin, Frank Case, installed a big round table in the Rose Room (the hotel’s main dining room) and it was reserved for the group; outsiders could sit at other tables and eavesdrop. As columnists like “FPA” (Adams) and Heywood Broun quoted their pals and reported on their exploits, the group’s fame grew. If you’ve ever wondered how so many of the witty remarks attributed to Round Table members got recorded for posterity — that’s how. It stands to reason, though, that a lot of verbal gems got lost simply because they weren’t heard. With that many clever conversationalists trying to top one another, the Rose Room must have been noisy — and when everyone is talking, who’s listening? One who listened was Harold Ross, who founded The New Yorker magazine in 1925 and recruited several of his round Table friends to come to work for him. He rented office space in a building in the next block up from the Algonquin; if nothing else, his employees didn’t have far to walk after their long lunches. Those multi-hour sessions may have cost the participants time that could have been put to more productive use. Some — like Benchley, Dorothy Parker and Alexander Woollcott — are mostly remembered now when one of their quips shows up in a magazine or newspaper under a heading like “Wit & Wisdom”. Others — Robert Sherwood, Edna Ferber, Ring Lardner — established more lasting reputations. Soon after the Great Depression hit, the Algonquin Round Table dispersed. Out-of-towners and other visitors took their places at the big table in the Rose Room; the clever remarks were gone, and so was the raucous laughter. 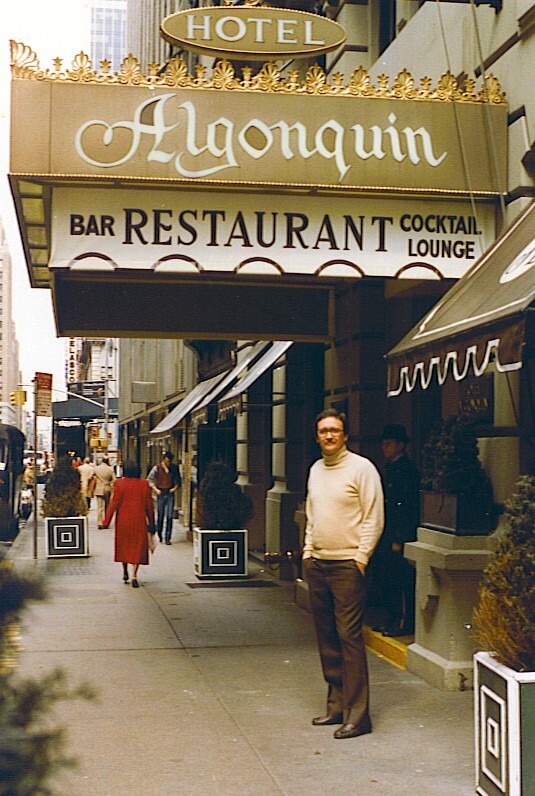 Over 50 years later I took my family on a sort of pilgrimage to the Algonquin, because I was an admirer of much of the writing the Round Table members had done. We ate in the Rose Room, but none of us said anything clever enough to deserve publication. In fact, I don’t think I said much of anything; I was busy imagining the group that had once been there, and hearing echoes. This entry was posted in Language and Literature and tagged Algonquin Round Table, Dorothy Parker, Robert Benchley. Bookmark the permalink.